It nearly made it into the NEW book, (as opposed to the OLD book) I just didn’t get to it in time…so lucky you. It is on here…hoping you are all over it! Everything shows up on Insta first these days. My Instagram feed is literally that. My culinary feed to all that we are eating in our house, or that I am working on in picture format. SO…now we have the social media stuff sorted, (did I mention Pinterest? And of course my email newsletter full of amazing recipes each week, which you receive by registering on this site) BUT lets get on with the recipe. Shall we? Preheat oven to 200ºC and line a baking tray with paper. Cut eggplants in half, and remove flesh from centre, forming a hollowed out ‘boat’ with about a 2 cm perimeter. Salt the eggplants well, as well as the eggplant removed from the centre and allow to drain in a colander for about 10-20 minutes. Rinse and pat dry with a paper towel and place onto prepared tray. Drizzle ‘boats’ with EVOO and roast about 10 minutes. Roughly cube the eggplant from the centre. Place cheeses into Thermomix bowl and mill 6 sec/speed 10. Remove from bowl and set aside. Place onion, garlic, cinnamon, cumin, oregano, and a little EVOO into Thermomix bowl and chop 2 sec/speed 6. Add bay leaves and sauté 5 min/Varoma/speed 1. Add tomatoes, meat and cubed eggplant. Cook 10 min/100ºC/Reverse/speed 1. To make béchamel, place all ingredients into Thermomix bowl and cook 8 min/80ºC/speed 4. Add half the cheese and stir 20 sec/speed 4. Fill eggplants with meat mixture. Top with bechemel and finish with the grated cheese, divided equally between each. Return to oven for 20 minutes until well cooked and cheese sauce is browned and bubbling. If you wanted to extend this recipe to feed more, just add a half eggplant per person. The meat will stretch with the eggplant, so no need to add more. 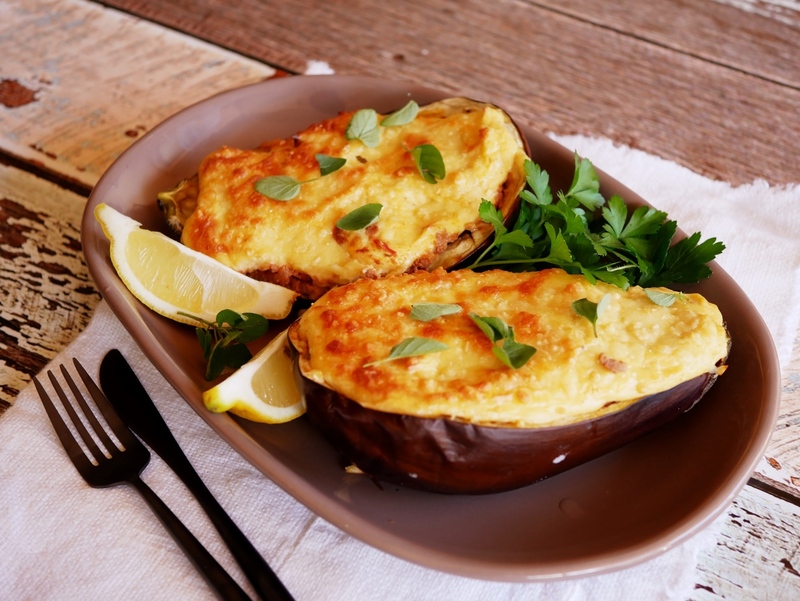 Serve with lemon wedges, fresh oregano and parsley leaves alongside a salad.